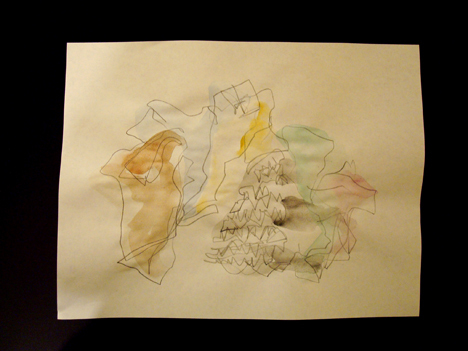 A pile of clothing, which looks a bit like landscape in picture. It includes two jumpers that I crocheted but didn’t wear much, but makes some interesting patterns in the picture. Also in the picture are a t‐shirt, a crocheted bolero, and a jean skirt I made from a pair of jeans. And this week we are saying goodbye to Larry on Mike’s parallel blogiverse. You might also notice that the header image has changed! 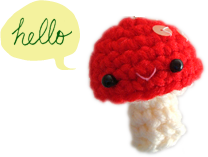 :D I post about many different kinds of crafts on this blog but I thought the friendly mushroom really represents what I like and what I like to make the most. And it’s all spring‐like and cheerful! All this talk about purging and getting rid of things has me thinking about “spring cleaning”.